People think that exercise bikes that come under the price range of $200 are brittle and not durable. Although this is the case with some of the cheap exercise bikes there are still some of the best exercise bikes under $200 that are built to last. Researching these types of bikes that are well built may be a tough job for you. 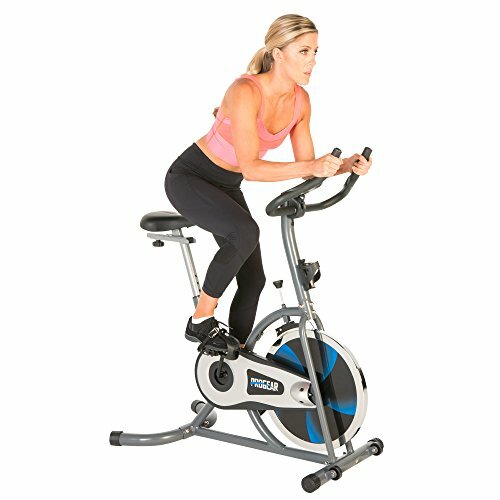 To make the job simpler, I did the research about the low-end exercise bikes and have presented this blog post reviewing some of the best bikes under $200. Having a good exercise bike in your home helps you stay strong and also is very helpful for cardiovascular health. Hope you'll love this post. Build: The bike is meant to provide a great workout in a small space. The best part about this bike is that it's foldable. This means that when the bike is not in use, it can be folded and stored under your bed and compactly in your closet. The assembly of this bike is very straightforward that too with a manual. You just need to attach seat, pedals, handlebars and the stabilizer bars using the three wrenches this bike comes with. The X-frame design that this bike comes with enables the bike to withstand the weight of 300 lbs, which is quite great when compared to other folding bikes in the range. The bike comes with a belt drive. This prevents the need of any maintenance like lubrication you need to do in case of the chain drive. The belt drive is also potentially very silent while riding. As like that of other upright bikes, this bike is not meant for intense workouts. If you are looking for a bike to do intense workouts, spin bikes would be the best bikes to go. Comfort: Unlike other upright and spin bikes, the seat is not small and uncomfortable. The seat in this bike is little wider than usual and more comfortable. The comfort of the seats is almost comparable to that of recumbent bikes in this range. The resistance mechanism is magnetic. In these magnetic spin bikes you just need to turn up the tension knob to change the resistance levels. The bike is super silent and all it is due to the belt drive and quiet magnetic resistance this bike comes with. The seat comes with height adjustments so that people of different heights can easily get a good ride out of this bike. Features: The main attraction of this bike is the pulse or heart rate sensor that it comes with. This feature is uncommon to see in the case of entry-level bikes. The data shown by the sensor is totally dependent upon the contact of your wrist with the pulse sensor. The LCD display shows the data like time, distance, odometer, heart rate, calories burnt, and much more. Build: This one is a good bike for them, who would like to have additional fancy features on their upright bike. The bike is well-built and supports up to 250 pounds which is quite decent for entry-level exercise bikes. The bike has a small footprint, combined with X-frame-design. The bike is easily foldable. After folding the bike, it takes 1/2 the space of the original size. 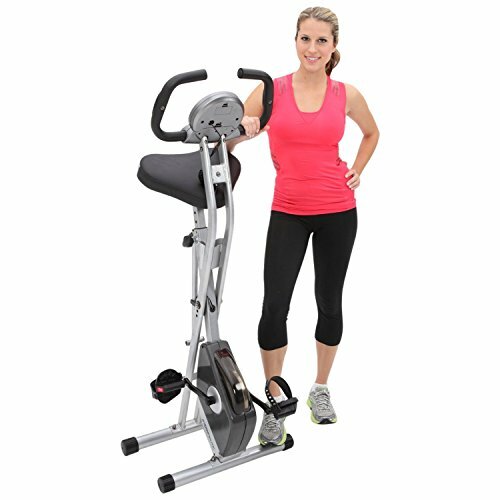 Like that of Exerpeutic Magnetic Upright Bike, the bike is compact. The main attraction for buying this bike is the Univeral Tablet Holder this bike comes with. This makes the riding much fun as you can watch movies or work on your tablet while working out. There's less noise while riding this bike, and no friction whatsoever. I would expect the bike to last at least 4-5 years and is built exceptionally well. Comfort: The seat is not so comfortable like that of other bikes. Needless to say, the comfort offered by the seat is purely subjective. However, some users reported that the use of a good gel cover for the seat makes it exceptionally comfortable. The backrest is not adjustable. The seat moves 3-4 inches back and forth relative to the backrest. Needless to say, the backrest offers good comfort to your back in case if you have back pain. The pedal arm is about only 4 inches long so the diameter of the circular motion of your legs while riding is small. So, I must say that this upright bike is only for light workouts, not for intense workouts. 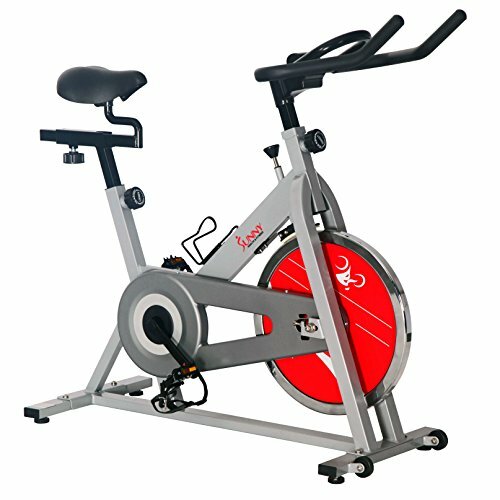 If you are looking for heavy workouts, consider the spin bike under $200 like Sunny SF-B1001 I've reviewed below. Features: As I've told you earlier, this bike comes with a tablet holder that keeps you entertained during the workout if you wish. The LCD displays all the information like time, calories burnt, distance and others. This bike lacks pulse rate monitor, as it comes with no sensors. Build: The bike is built with high-quality steel. So you need not worry about the durability of the bike. The bike is very sturdy and does not wobble at all while riding. The bike comes with a 30lbs flywheel, that ensures that the riding is smooth. The flywheel weight is decent for entry-level spin bikes. It easily simulates the real bicycle riding experience. The resistance mechanism is mechanical. That means you need to replace the brake pads once every year or two, based on how hard you workout. The bike is not quite silent, it does make some noise while riding. However, if you listen to music while working out, this won't be a problem. Comfort: The bike offers great comfort. The seat is a bit narrow and hard with not enough padding. The comfort of the seat can be fixed by adding a gel cover or replacing the entire seat with a much comfortable seat. The seat height and the horizontal position of the seat can be adjusted. The handlebar height can also be adjusted to make the workout more comfortable. However, you do need to note that, with any spin bike you need to lean down a bit to reach the handlebar comfortably. If you have any back issues, then, getting a recumbent bike would be ideal for you. The pedals come with toe straps to ensure a comfort position of the feet on the pedals while working out intensely. Features: This bike won't come with any accessories like LCD display or heart rate monitor. But it does come with a water bottle to keep you hydrated while working out for hours. Build: This is the best recumbent bike under the price range of $200. 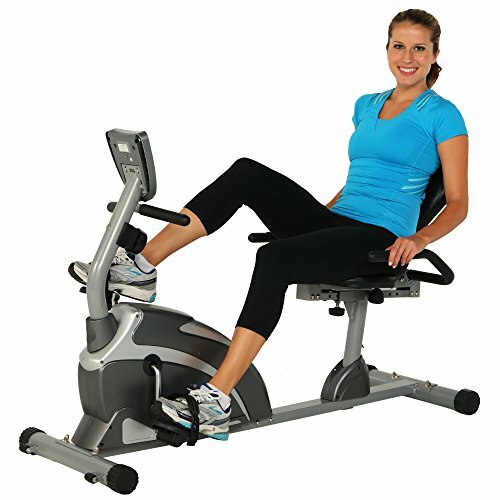 The recumbent bikes like this are meant especially for seniors or people with back issues to get a light cardio workout. The great part about this bike is the extended stabilizers. These stabilizers ensure that the bike won't wobble while working out hard. The bike handles up to 300lbs of weight which is great for a recumbent bike. The resistance mechanism in this bike is magnetic. The bike does not make any noise while riding. There are 8 levels of resistance when tightening the knob. The bike also comes with transport wheels which make the movement of the bike to and fro easier. Comfort: The seats are greatly comfortable and padded thickly to avoid any discomfort. The backrest is also very comfortable is very useful for elderly people. The seat is positioned near to the ground and feature a "step thru" design. This makes getting on and off the seat a very easy process. The bike comes with two handlebars. One on the sides and another in the front (regular position). The pulse sensor is located at the side handlebars. So, if you want the bike to track the heart rate, you need to make sure that your hands rest on the side handlebars. The pedals are textured and have straps to ensure you have a good grip while riding the bike. There's nothing to complain about comfort whatsoever. Features: A great feature is that is bike comes with a heart rate monitor. It also comes with a bright LCD that does the job well by displaying essential data like time, distance, calories burnt, and others. Apart from this, the bike does not come with any water bottle holders. This means you need to step down from the bike and get hydrated. Build: This is comparatively a light bike, that is still built great with steel and stabilizer bars that are meant to offer you sturdy workouts. The rear stabilizer end caps can be turned to balance up the bike when riding on uneven surfaces. The seat can be adjusted both vertically and horizontally. This makes it easier for people of various heights to easily reach the handlebars. The handlebars have no adjustment. You need to move the seat closer to the handlebars in case if you have trouble reaching the handles. The bike uses the chain drive coupled with mechanical brake resistance. The flywheel weight is 22 lbs, which quite low when compared to other spin bikes. Nevertheless, the drive is smooth. Comfort: The seat is pretty than other bikes in this range. But still, some people find the seat to be narrow. At last, it all comes down to the personal preference. The bike makes some noise due to the mechanical resistance and the chain drive. This is the case with almost all spin bikes that don't have magnetic resistance. The pedals are extremely comfortable, and they come with toe cages and straps to slide in your foot comfortably. With this, you can easily stand and workout without the risk of your foot slipping out from the position. The bike also comes with two transport wheels to make the relocation of the bike easier. You'll not notice the importance of the transport wheels on the bike until the time comes up. Features: The basic LCD console displays data like time, calories burnt, distance, and others. The bike also comes with a heart rate sensors to display the heart rate. This will only be tracked when you properly grip both your hands on the sensors located on the handlebars. The bike also comes with a small water bottle holder at the front. This is a nice addition. Although the entry-level bikes like these won't come with some fancy features like workout programs, cloud sync, and so on, they are more than essential for regular workouts to stay in shape. These are some of the best exercise bikes that you can get under $200. If you think I've missed any of the good bikes under $200 that fits in the top 5 list, do mention them in the comments section below. Don't forget to share the article with your community.